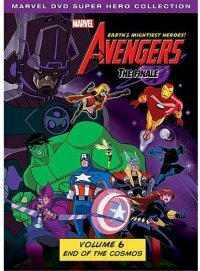 Bonus features: Avengers mission reports ; the Avengers: Earth's mightiest heroes heroic humor ; The Avengers: Earth's Mightiest heroes greatest "Hits". disc 2 -- Avengers assemble! Brian Bloom, Fred Tatasciore, Wally Wingert. Join Earth's Mightiest Heroes as they embark on their final journey. See how the epic tale ends when the Avengers wage war with the biggest Marvel villain of them all, Galactus! Spider-Man, Wolverine, Red Hulk, Winter Soldier, War Machine, and more of your favorite members of the Marvel Universe join forces with the Avengers as they prepare for their ultimate battle. Experience all twelve action-packed episodes. DVD, NTSC, region 1, widescreen (1.78:1) enhanced for 16x9 televisions, Dolby digital. Burbank Calif. : Distributed by Buena Vista Home Entertainment, 2013. Description: 2 videodiscs (270 min.) : sd., col. ; 4 3/4 in.